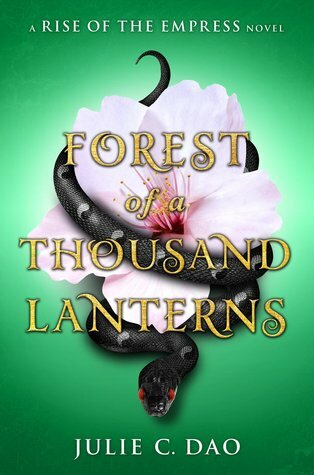 Disclaimer: This is part of the PH-based blog tour for Forest of a Thousand Lanterns that Erika of The Nocturnal Fey hosted. This doesn’t affect on my thoughts on the book. So this a first for me to join a blog tour and I didn’t want to miss the opportunity to try. I heard the big hype on this book before I signed up for this tour. I got mesmerized by the cover and I do like snakes 😂 true I do but not the poisonous ones though, I don’t wanna die 😅🙈 . Anyways I didn’t know much on how or why the hype was big for this book at first but after reading the blurb I got intrigued and it grabbed my interest. I am a fan of retellings especially well written ones that keeps me on edge and Julie C. Dao went to the next level on this retelling of the Evil Queen. Forest of A Thousand Lanterns tells the story of a young girl named Xifeng (pronounced as SHE-fung). She lives with her old aunt, Guma, who reads the cards and tells her of a great destiny that awaits her. The stars tells her that she’s destined become the Empress of Feng Lu. So! The setting, the plot, the characters and how this book was written. I love it so much! This is not what I typically expected on a retelling. This is a whole new level. I wouldn’t have even thought of this idea of doing a retelling of a favorite fairy tale character in this setting. It’s set in a East Asian Historical! I am a sucker for Historical setting stories and this was set in East Asia which made me want to read it more. I have been reading more historical western settings so this is refreshing for me. While reading the whole book it’s like I am watching a Korean Drama. Yes this book would be perfect to adapted as a K-drama. Yes the characters are not what I expected which is good. I sometimes hate my gut feeling being right and the surprise is not much of a surprise. But there are some non-existent characters in the book that I hoped that would appear more but some parts of the story make up for that pet peeve of mine. The story focuses on Xifeng’s story. All her struggles and small victories as she reach to the goal of her destiny. Some might relate to Xifeng’s inner battle to herself. Questioning her choices and how it would impact not just to her but the people around her. I just love the complexities of the characters’ personalities. I love his bubbly personality more and the sass he has. yassss. The bloody gore! Yass Dao didn’t shy away from gory scenes. I like a good bloody battle especially when assassins and demons are involved so don’t censor it. Also the drama in an East Asian courts is totally refreshing. Been watching Reign and Tudors for a while so I got more what I bargain for on this book. I am happy that I followed my gut to join this tour for this book. I JUST LOVE THIS BOOK! It is very well written and I have so many quotes saved from this. Isn’t’ it better to give up a fraction of your freedom to gain tenfold in happiness, even for a short time? The ending of this book is not a cliffhanger. So you can sigh in relief if you don’t like cliffys. But the ending will make you anticipate the next book. Wanting to know more of the story. My rating is 🌟🌟🌟🌟🌟 5/5 stars! and I recommend this to readers who has love for anti-heroes, the evil queen, retellings, K-dramas, and historical fiction. You will surely love Dao’s original take on the story of the Evil Queen. GURL! I also mentioned that Kang reminds me of Lord Varys! OMG I thought it’s just me! Di baaaa, Kang just really reminds me of him. That Introvert, bookhoarding, anime otaku cat lady who has no self-control, too much interest, not enough time and moolah. I also love to draw stuff and write stuff.